The entire issue can be downloaded as a pdf here. Excerpts from the abstract and links to individual articles are displayed below. Letter From the Editors. James Polega, Garrett Roe, and Danny Yau. The editors of MSRJ are excited to announce our Winter 2017 issue. We would like to thank everyone for waiting patiently during our brief hiatus. Since the release of our last issue we have been working diligently to retool our publish- ing process and we are delighted to announce the result of this work. All articles accepted for publication in MSRJ will now be featured as an electronic publication ahead of appearing in our print issue. Combating Obstacles to Empathy: A Replicable Small-Group Discussion Series for Medical Students. Francesca Kingery, Alexander Bajorek, Amber Zimmer Deptola, Karen Hughes Miller, Craig Ziegler, Pradip Patel. Background: The expression of humanism in patient encounters is a core component of the medical profession and evolving national medical student curriculum. Growing evidence suggests that empathetic care improves patient outcomes and diagnostic accuracy while decreasing physician stress and rates of litigation. Unfortunately, multiple recent studies using different scales and survey tools have consistently shown empathy to decrease during the third and fourth years of medical school. Methods: We developed a replicable, case-based, student and expert-driven, small-group discussion series designed to address this decline. Over 2 years, the series included four separate discussions over controversial topics seldom addressed by formal courses (Chronic Pain Management vs. Prescription Drug Abuse, Balancing Business and Medicine, and Domestic Violence). We utilized pre- and post-session surveys to qualitatively and quantitatively evaluate the program. Results: Our results demonstrated significant improvement in participants’ comfort with the subject matter and desire to approach faculty and peers regarding humanistic patient care. Conclusion: Future and more frequent interactions, combined with optimization of the format could further uncover the utility of this program. Ultimately, we believe our discussion series could be replicated on other medical campuses. Read more here. Time to Neurological Deterioration in Ischemic Stroke. James E. Siegler, Karen C. Albright, Alexander J. George, Amelia K. Boehme, Michael A. Gillette, Andre D. Kumar, Monica Aswani, Sheryl Martin-Schild. Background: Neurological deterioration (ND) is common, with nearly one-half of ND patients deteriorating within the first 24 to 48 h of stroke. The timing of ND with respect to ND etiology and reversibility has not been investigated. Methods: At our center, we define ND as an increase of 2 or more points in the National Institutes of Health Stroke Scale (NIHSS) score within 24 h and categorize etiologies of ND according to clinical reversibility. ND etiologies were considered nonreversible if such causes may have produced or extended any areas of ischemic neurologic injury due to temporary or permanent impairment in cerebral perfusion. Results: Seventy-one of 350 ischemic stroke patients experienced ND. Over half (54.9%) of the patients who experienced ND did so within 48 h of last seen normal. The median time to ND for nonreversible causes was 1.5 days (interquartile range (IQR) 0.9, 2.4 days) versus 2.6 days for reversible causes (IQR 1.4, 5.5 days, p 0.011). After adjusting for NIHSS and hematocrit on admission, the log-normal survival model demonstrated that for each 1-year increase in a patient’s age, we expect a 3.9% shorter time to ND (p 0.0257). In addition, adjusting for age and hematocrit on admission, we found that for each 1-point increase in the admission NIHSS, we expect a 3.1% shorter time to ND (p 0.0034). Conclusions: We found that despite having similar stroke severity and age, patients with nonreversible causes of ND had significantly shorter median time to ND when compared with patients with reversible causes of ND. Link here. Determining if a Relationship Exists between Tonsillar Ectopia and Symptom Presentation in Chiari Malformation Patients. Julia R. Saling, Paige Marty, Rebecca Fischbein, Michelle Chyatte. Purpose: Chiari malformation type I (CM I) is characterized by cerebellar tonsil ectopia and has varying symptomatology. Previous research has shown a relationship between tonsillar dominance and related conditions, but few have examined association with symptomatology. This study attempts to elucidate a relationship between cerebellar tonsil dominance, age, and symptomatology. Methods: Data about the CM I patients were extracted from the Conquer Chiari Patient Registry. Tonsillar dominance was determined using a ratio of right-to-left herniation length. Pearson’s correlation and one-tailed Student’s t-test were used for analysis. Results: Length of tonsillar descent appears to be negatively correlated with age of onset (r 0.266; pB0.001; n 113) and diagnosis (r 0.323; p B0.001; n 113). No correlation was found between tonsillar dominance and symptom location, or between tonsillar dominance and symptom severity bilaterally (p 0.05). Symptom location and severity ratios appear to be correlated (r 0.666; p B0.001). Tonsillar descent length appears to be strongly correlated bilaterally (r 0.972; p B0.001; n 50). Conclusion: Inconsistency between tonsillar dominance as related to symptomatology suggests a multifactorial contribution to clinical presentation. The inverse relationship between tonsillar herniation length and age of symptom onset and diagnosis suggests herniation length may be an important predictor for clinical outcomes. Further research is needed to elucidate additional contributing factors and tonsillar dominance and symptomatology association. Link here. Pain Relief and Intervertebral Disc Rehydration Following Wallis Interspinous Device Implantation: A Case Report. Carter R. Mohnssen, Kenneth Pettine, Nicole Rittenhouse. Introduction: Degeneration of the lumbar motion segment is the primary cause of low back pain in many individuals. Therefore, new minimally invasive treatments are being sought. Patient profile: A 47-year-old man presented with severe low back pain and radicular symptoms of several years duration. Lumbar Magnetic Resonance Imaging (MRI) scan revealed severe desiccation, loss of disc height, and an annular tear with right lateral disc protrusion at L4 5. Interventions/outcomes: After conservative treatment failed, the patient received a Wallis† interspinous spacer at the affected level. A 100% subjective pain relief was obtained at 3 months postoperative. Nucleus pulposus rehydration on MRI was observed. Discussion: Controversy exists over whether disc dehydration is a reliable indicator of low back pain; however, interspinous spacers seem to alter abnormal motion segment’s biomechanics in a way that results in alleviation of low back pain and increased range of motion. With the advent of biologic therapy, this may provide an intriguing minimally invasive treatment modality, although further research is needed. Link here. Polega J., Roe G., Yau D. Letter From the Editors. Medical Student Research Journal. 2017;5(Winter):1. Goote P. Human Skull Word Cloud. Medical Student Research Journal. 2017;5(Winter):2. Kingery F., Bajorek A., Deptola A., Miller K., Ziegler C., Patel P. Combating Obstacles to Empathy: A Replicable Small-Group Discussion Series for Medical Students. 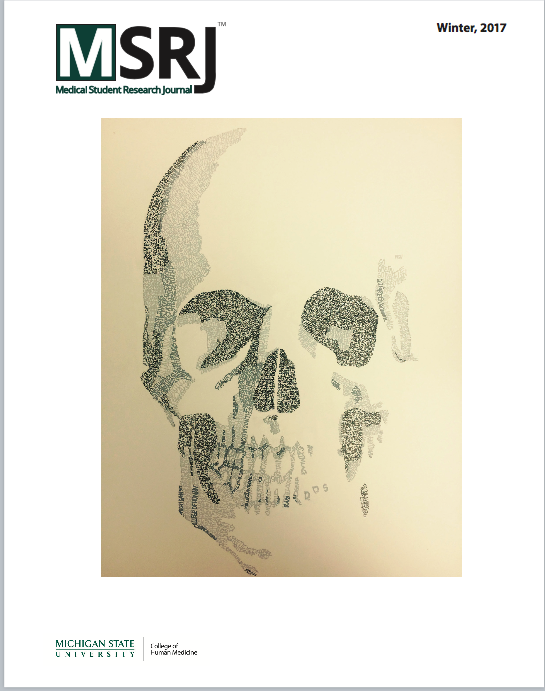 Medical Student Research Journal. 2017;5(Winter):3-9. Guo X., Xiao S. Does Traditional Chinese Medicine Matter? Medical Choices of Rural Diabetic Patients in Changsha, China. 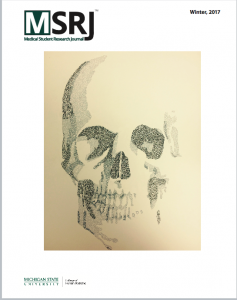 Medical Student Research Journal. 2017;5(Winter):10-17. Siegler J., Albright K., George A., Boehme A., Gillette M., Kumar A., Aswani M., Schild S. Time to Neurological Deterioration in Ischemic Stroke. Medical Student Research Journal. 2017;5(Winter):18-24. Saling J., Marty P., Fischbein R., Chyatte M. Determining if a Relationship Exists Between Tonsillar Ectopia and Symptom Presentation in Chiari Malformation Patients. Medical Student Research Journal. 2017;5(Winter):25-31. Mohnssen C., Pettine K., Rittenhouse N. Pain Relief and Intervertebral Disc Rehydration Following Wallis Interspinous Device Implantation: A Case Report. Medical Student Research Journal. 2017;5(Winter):32-35.